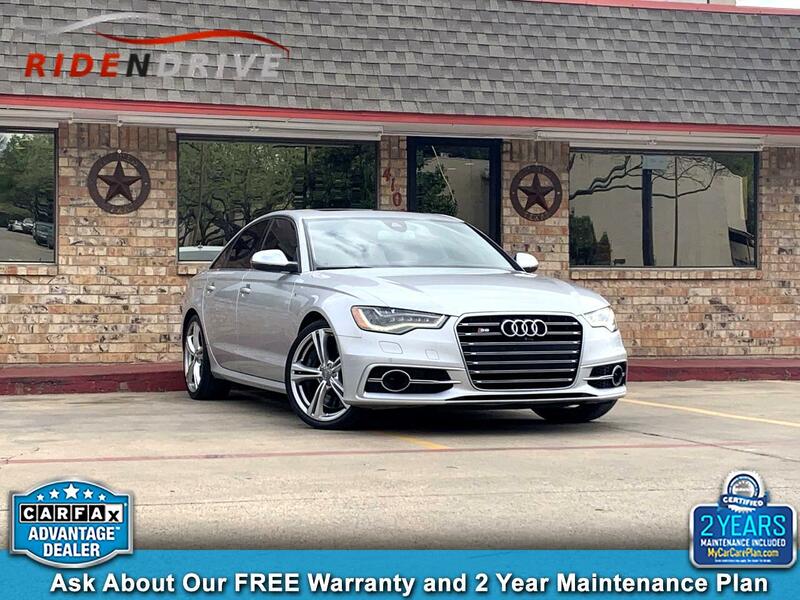 2013 AUDI S6 PRESTIGE PKG. V8 4.0 LITER TWIN TURBOCHARGED 420 HP. AUTOMATIC TIPTRONIC TRANSMISSION. CLEAN CARFAX. 3 OWNERS. 20 SERVICE RECORDS. BRAND NEW BRAKES & TIRES. DIAMOND STITCHED SEATS. CARBON FIBER INTERIOR TRIM. NAVI. SUNROOF. MASSAGE SEATS. BLIND SPOT ASSIST. LANE ASSIST. NIGHT VISION. LANE DEPARTURE. ADAPTIVE CRUISE. HEADS UP DISPLAY. 360 VIEWS BACK UP CAMERA WITH PARKING SENSORS. HEATED SEATS. HEATED REAR SEATS. HEATED STEERING WHEEL. BOSE SURROUND SOUND SYSTEM. 20 INCH ALLOY WHEELS. KEY-LESS GO. PUSH START. BLUETOOTH/AUX CONNECTIVITY. ***ASK ABOUT OUR FREE SHIPPING***. FREE 3 MONTH SUBSCRIPTION OF SIRIUS XM RADIO. ASK ABOUT OUR FREE WARRANTY & 2 YEAR MAINTENANCE PLAN INCLUDED!! VALUED AT $1500. ASK A SALES ASSOCIATE FOR DETAILS (ONLY ON QUALIFYING VEHICLES). Visit Ride-N-Drive online at ridendrivedallas.com to see more pictures of this vehicle or call us at 972-271-5100 today to schedule your test drive.